SMES store energy in the magnetic field created by the flow of direct current in a superconducting coil which has been cryogenically cooled to a temperature below its superconducting critical temperature. A typical SMES system includes three parts: superconducting coil, power conditioning system and cryogenically cooled refrigerator. Once the superconducting coil is charged, the current will not decay and the magnetic energy can be stored indefinitely. 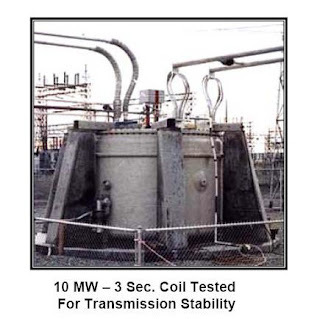 The stored energy can be released back to the network by discharging the coil. The power conditioning system uses an inverter/rectifier to transform alternating current (AC) power to direct current or convert DC back to AC power. Superconducting magnetic energy storage systems store energy in the field of a large magnetic coil with direct current flowing. It can be converted back to AC electric current as needed. A magnetic field is created by circulating a DC current in a closed coil of superconducting wire. The path of the coil circulating current can be opened with a solid state switch which is modulated on and off. Due to the high inductance of the coil, when the switch is off (open), the magnetic coil behaves as a current source and will force current into the capacitor which will charge to some voltage level. Proper modulation of the solid-state switch can hold the voltage across the capacitor within the proper operating range of the inverter. An inverter converts the DC voltage into AC power. SMES systems are large and generally used for short durations, such as utility switching events. Solenoid - A coil wound into a tightly packed helix. In physics, the term solenoid refers to a long, thin loop of wire, often wrapped around a metallic core, which produces a magnetic field when an electric current is passed through it. Solenoids are important because they can create controlled magnetic fields and can be used as electromagnets. Toroid - A doughnut-shaped object, such as an O-ring. Its annular shape is generated by revolving a plane geometrical figure about an axis external to that figure which is parallel to the plane of the figure and does not intersect the figure. Toroidal geometry can help to lessen the external magnetic forces and therefore reduces the size of mechanical support needed. Also, due to the low external magnetic field, toroidal SMES can be located near a utility or customer load. In toroidal SMES, the coil is always under compression by the outer hoops and two disks, one of which is on the top and the other is on the bottom to avoid breakage. Currently, there is little need for toroidal geometry for small SMES, but as the size increases, mechanical forces become more important and the toroidal coil is needed. SMES is currently used for short duration energy storage. Therefore, SMES is most commonly devoted to improving power quality. If SMES were to be used for utilities it would be a diurnal storage device, charged from base load power at night and meeting peak loads during the day. Frequency Regulation - The time delay during charge and discharge is quite short. Power is available almost instantaneously and very high power output can be provided for a brief period of time. Other energy storage methods, such as pumped hydro or compressed air have a substantial time delay associated with the energy conversion of stored mechanical energy back into electricity. Voltage Regulation - SMES is also used in utility applications to provide grid stability in distribution systems. In northern Wisconsin, a string of distributed SMES units was deployed to enhance stability of a transmission loop. The transmission line is subject to large, sudden load changes due to the operation of a paper mill, with the potential for uncontrolled fluctuations and voltage collapse. Power Quality Control - Several 1 MW SMES units are used for power quality control especially to provide power quality at manufacturing plants requiring ultra-clean power, such as microchip fabrication facilities. Reliability - The main parts in a SMES are motionless, which results in high reliability. Cost - The high cost of superconductors is the primary limitation for commercial use. The cost incurred is higher than other technologies such as capacitors, CAES, flywheels but lower than battery systems. Cryogenics - Cold temperature technology can be a challenge. Energy requirements of refrigeration the cooling requirements incur energy and maintenance costs. Mechanical Support - Needed because of lorentz forces. Size - To achieve commercially useful levels of storage, around 1 GW·h (3.6 TJ), a SMES installation would need a loop of around 100 miles. This is traditionally pictured as a circle, though in practice it could be more like a rounded rectangle. In either case it would require access to a significant amount of land to house the installation, and to contain the health effects noted below. Manufacturing - There are two manufacturing issues around SMES. The first is the fabrication of bulk cable suitable to carry the current. Most of the superconducting materials found to date are relatively delicate ceramics, making it difficult to use established techniques to draw extended lengths of superconducting wire. Much research has focussed on layer deposit techniques, applying a thin film of material onto a stable substrate, but this is currently only suitable for small-scale electrical circuits. Infrastructure - Until room-temperature superconductors are found, the 100 mile loop of wire would have to be contained within a vacuum flask of liquid nitrogen. This in turn would require stable support, most commonly envisioned by burying the installation. Critical Current - In general power systems look to maximize the current they are able to handle. This makes any losses due to inefficiencies in the system relatively insignificant. Unfortunately the superconducting properties of most materials break down as current increases, at a level known as the critical current. Current materials struggle, therefore, to carry sufficient current to make a commercial storage facility economically viable. New materials and chemical processes are needed to improve their charge storage capabilities by increasing both their energy and their power densities. Incremental changes in existing technologies will not produce the breakthroughs needed to realize these improvements. Rather, a fundamental understanding of the physical and chemical processes that take place in the EC—including the electrodes, the electrolytes, and especially their interfaces—is needed to design revolutionary concepts. The Engineering Test Model is a large SMES with a capacity of approximately 20 MW•h, capable of providing 400 MW of power for 100 seconds or 10 MW of power for 2 hours. American Superconductor (NASDAQ: AMSC)- Devens, MA - AMSC’s D-VAR system is ideally suited to help meet wind farm interconnection standards. The D-VAR system is a fully integrated, inverter-based reactive compensation system (STATCOM). It can be seamlessly integrated with low cost capacitor banks in an extremely cost-effective solution that provides steady-state voltage regulation, power factor correction, and high and low voltage ride through capability for the entire wind farm. The D-VAR system can also “soft-switch” capacitors, thereby eliminating the voltage step changes seen by the wind farm and the utility. ACCEL Instruments GmbH, Cologne, Germany - With its many years experience in design, manufacturing and testing ACCEL serves the increasing demand for superconducting accelerators world-wide. For production of the cavities either solid Niobium is used (bulk Nb cavities) or the technology of coating Nb-films on copper cavities is used (Nb/Cu sputter technology developed by CERN).